We are a small family business, that have been in business for around 2yrs. We have a small selection of bouncy castles to suit both boys and girls..
Nearly all our bouncy castles are suitable for indoor hires aswell as outdoor..
We offer a professional and reliable service to all our customers. 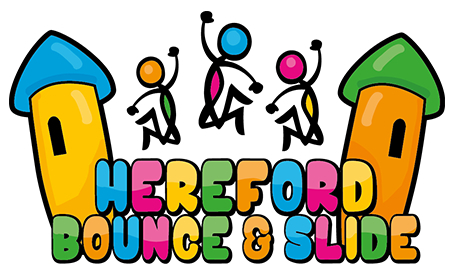 We at Hereford Bounce and Slide are happy to answer any questions you may have regarding any of our bouncy castles. Our top priority with all bookings is childrens safety and well being, all our inflatables are tested annually to be sure they are stillnin good safe condition for hire. Every castle has its own certificate to show it has passed, and some inflatables carry whats called a PIPA tag, this tag hag a number and website that you the customer can visit to check the castle you have booked has a valid test certificate. We clean our inflatables as often as possible. We have even been kniwn to brush off some castle at each drop off if we having a busy weekend, this so we know that any excess grass etc fromoutdoor hireis removed before your children start to use the bouncy castle. We have a dedicated website with booking system that shows you everything we do.